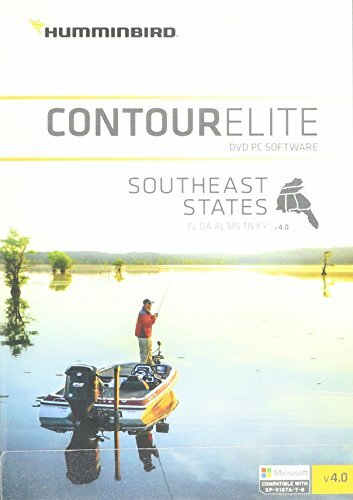 HumminbirdCESE3 | Contour Elite | 600024-4 ​Contour Elite - Southeast PC Software - April 2016 Note: Opened packages will not be eligible for credit return. Bring trip planning into the information age with Contour Elite. This unique software lets you access high-definition Humminbird lake data on your PC. Advanced features combined with a user-friendly interface to let you search by fish species, by key fishing structures or design a custom search. Whether it's a fishing report, a friendly recommendation or your own experience, Contour Elite lets you quickly turn information into results. Compatible with: Windows XP, Vista, Windows 7, Windows 8. Minimum PC Requirements: ◦1 Ghz Pentium 4 or Athlon CPU (2 Ghz recommended) ◦512 MB Ram (1024 MB Ram recommended) ◦10 GB Free hard drive Windows XP or greater ◦DVD-ROM Drive NOTE: Contour Elite is a COMPUTER PRODUCT only, CD's are not compatible with GPS units. Owners will only be able to view the maps using a compatible computer. Only our DIGITAL SD MAP CARDS are compatible with Humminbird fish finders.